If you love an underdog, you’ll love this video of a Ford Fiesta ST beating up on some formidable competition. In particular, the Ford Fiesta ST in this video is considered a Hellcat killer, and if you don’t believe us just watch. 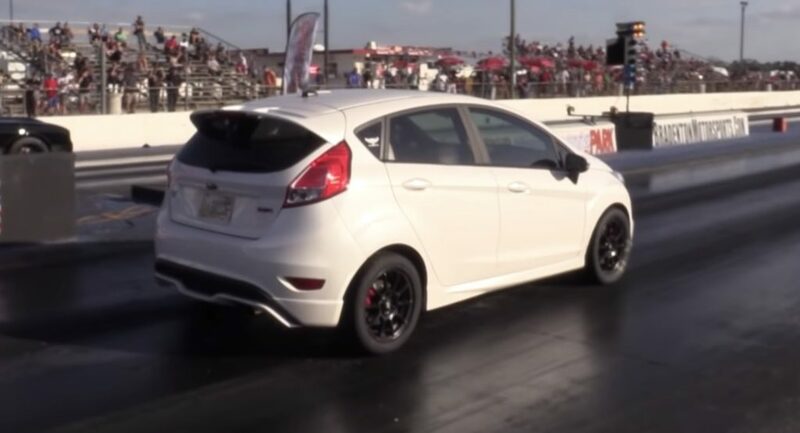 In this video montage, the smaller, lighter, FWD Ford Fiesta ST outpaces a Hellcat, Corvette Grand Sport, a Ford Mustang with bolt-ons, and it even stays with a modified GSXR 750 sport bike in a highway roll race. In a drag race against a Hellcat, the tuned Fiesta ST ran a quarter-mile in 11.269 seconds at 125.41 mph. That’s pretty impressive considering a stock Fiesta ST does zero to 60 mph in 6.4 seconds with a quarter-mile time of 14.9 seconds at just 94.6 mph. We’re not exactly sure what has been done to modify this Ford Fiesta ST, but it sounds like there’s a lot going on. Our guess is a larger turbocharger with an aggressive tune, an upgraded intake and exhaust system, and supporting modifications like an intercooler and possibly even forged internals. At the end of the video, it appears that there is a nitrous tank on board – which definitely explains a few things. Tires are a big help, too, and it looks like this Fiesta ST is running drag radials or slicks of some kind. With grippier tires and launch control, this Fiesta ST has no problem taking down some heavy hitters. With that said, the Hellcat in this video did not perform up to its potential. Dodge claims a Hellcat can complete the quarter-mile in about 11.2 seconds with stock tires. This Hellcat, however, took 12.342 seconds to get down the strip. Details aside, this little Fiesta ST is a pocket monster and it’s worth watching to see what it can do. If the Focus was electric, it will go even quicker and cost much less.